The clock is ticking until this years panto Beauty & The Beast!! Welcome to the Lochaber Showstoppers website. 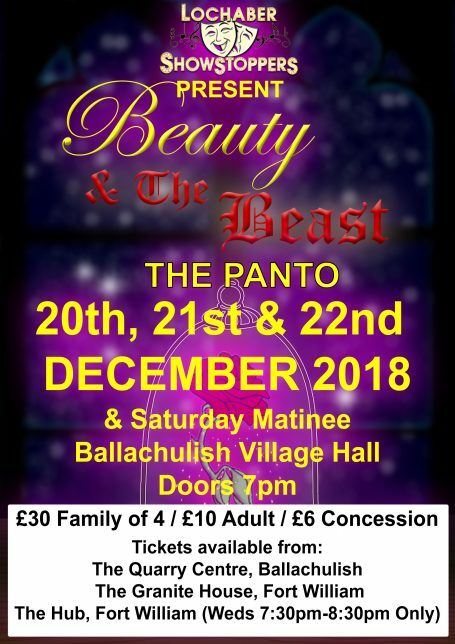 Lochaber Showstoppers is a community musical theatre group based in Fort William. Our members range in age from 13 to 70+ and our aim is to entertain the good people of Lochaber with our twice yearly performances. Absolutely anyone can join us, regardless of musical or acting experience, as long as you’re enthusiatic and love to perform.